How long until an avocado tree fruits? I just planted the avocado tree in the photo above, on February 10, 2017. It’s a Hass from a five-gallon container. How long can I expect to wait for an avocado tree like this to bear fruit? Short answer: three to four years. I get such an expectation from the fact that the last Hass tree I planted was in July 2013, and we are currently eating its first fruit here in 2017. So, four years of waiting and we now have 73 Hass avocados on that tree. 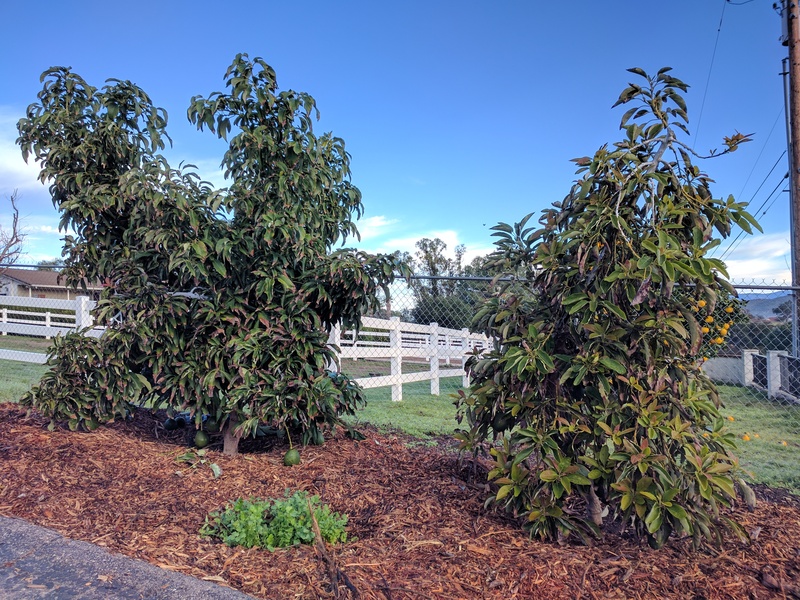 Four-year old Reed and Lamb trees with their second crops of 35 and 28 avocados, respectively. While trees typically bear in three to four years, you may get fruit earlier or later for a few reasons. On one hand, if you buy a bigger tree — 15-gallon size — you’re likely to get fruit earlier. That’s because the bigger tree will produce more flowers (and therefore potential fruit). 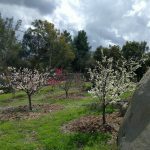 Also, if you have an excellent environment for pollination, with many other avocado trees around and many pollinators like honeybees visiting the flowers, you’re likely to get fruit earlier. Avocado trees of the five-gallon size will often set fruit at nurseries each spring for this reason. Some varieties of avocado are also known to be precocious, such as the Pinkerton. This Pinkerton was planted from a five-gallon container in March 2016 and it set fruit that spring that we’ll eat at the end of 2017. That’s less than two years. That’s exceptional. On the other hand, your tree might take longer than four years to give you fruit for a number of reasons. If you prune it hard or if a winter freeze kills many branches or if it is otherwise stressed — for example, by poor irrigation — then it’s not going to fruit as early as it otherwise would. One final reason an avocado tree might take more than four years to bear fruit is if it is grown from seed and not grafted. In general, seedlings take longer to bear fruit than grafted trees. A seedling in my mom’s backyard took about six years before it produced fruit. Does waiting the typical three to four years for an avocado tree to bear fruit seem like a short or long time to you? It seemed like forever when I planted those trees back in 2013. But forever has arrived, and it tastes amazing. “It seemed like forever when I planted those trees back in 2013. 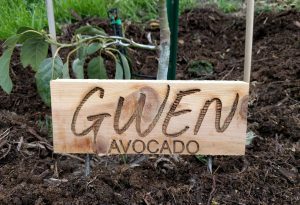 But forever has arrived, and it tastes amazing” … what a great line and a nice perspective for me as I’ve just planted 3 avocados of my own! Thanks, Greg! I’m glad I’ve already gotten some fruit, even though not a lot, from my trees planted in the summer of 2014., It was delicious and I could have eaten some with every meal. p I’m looking forward to more in the coming years. Hi, Greg, your website is fantastic! Thanks for all the great info! I found it because the avocado tree I gave my husband as a 2015 Father’s Day gift just began making flowers yesterday and I was desperate for info. The tree had a bunch of little clusters of buds but at first I did not know if they would be leaves or flowers. We live on Cape Cod and just brought the tree indoors last month, as we do each year when temps drop to around 40 degrees (we are in zone 7a). I was wondering if you think we might get any fruit the first year it flowers? I have to dig out the info; I think this is a Haas tree and I bought it from fastgrowingtrees.com. I believe it was between 1.5 and 2 years old when it arrived and I think it was grafted, perhaps in Florida or maybe Georgia (cannot remember). So, it might be a minimum of 4 years old now and that seems about right for flowers, as far as I can tell with only beginning my research. I think Bob repotted it (for the second time) this past summer. How much longer after the tree flowers might it set fruit and then how long would it take the fruit to grow before I would pick it to ripen? I still have a ton of research to do, but am so excited about seeing the cute little flowers for the first time! Cannot wait until my daughter comes home for the holidays…she is an environmental science grad student out there at UC Davis in the Soils & Biogeochemistry Department. Your boys are adorable, btw! Children are wonderful. I also have a son, 28, and another daughter, 22. And they all have been brought up loving vegetables; we also have a big garden. Also love your posts about chickens. We buy fresh eggs from a neighbor in southern Maine, where we have a second home, and his chickens are so friendly when we visit! Nothing store-bought compares to a fresh egg. 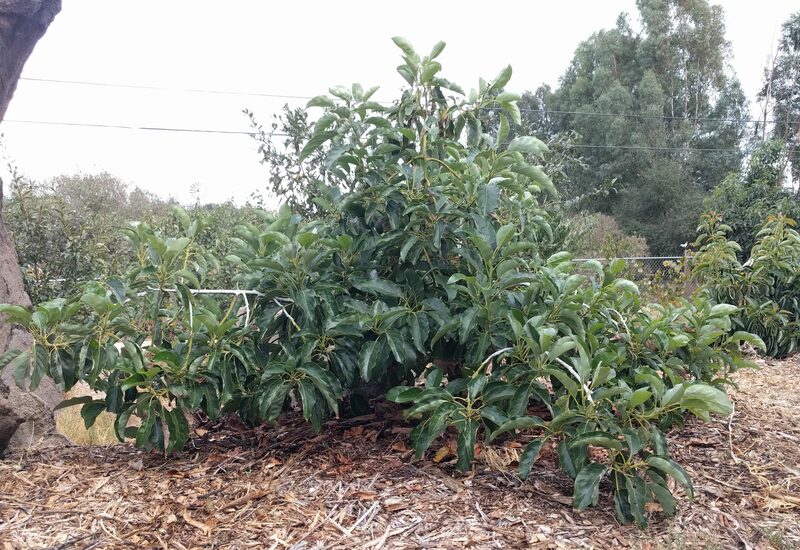 Correction: Sorry, it is a Cold Hardy Avocado; suggestion is that it could be planted with a Hass to increase yield, although it is a self-pollinator and does not need another tree to produce fruit. An avocado tree for Father’s Day . . . sounds like a perfect gift! The good news is that if an avocado tree flowers, it can set fruit — no matter how old it is. Avocado trees (grafted ones) just don’t usually set fruit until they’re a couple years old because their flowers are not very good at being pollinated. A giant avocado tree can have a million flowers (literally) but still only set a few hundred fruit; that’s a terrible batting average. To hand-pollinate, you need to use a small paint brush or Q-tip or something similar to brush the anthers when the flower is male and the anthers are dehiscent (you can see little flaps up like the ends are tattered). If you do this, enough pollen (need at least 20 grains) may stick to the stigma and fertilize it if the stigma is still white and receptive. Otherwise, you have to collect and store pollen to later apply to female flowers, which gets more complicated. Avocado varieties differ as to how long it takes for the fruit to mature. The range is about six months up to 18 months. This variety you bought is unknown to me. “Cold Hardy Avocado” is something I’ve never heard of before. But after reading the website’s description and seeing customer photos, I’d guess it might be the variety called ‘Mexicola’. Regardless, the avocado varieties that have the most cold tolerance all mature their fruit relatively fast, so you’re probably looking at six to 12 months from flower to mature fruit. 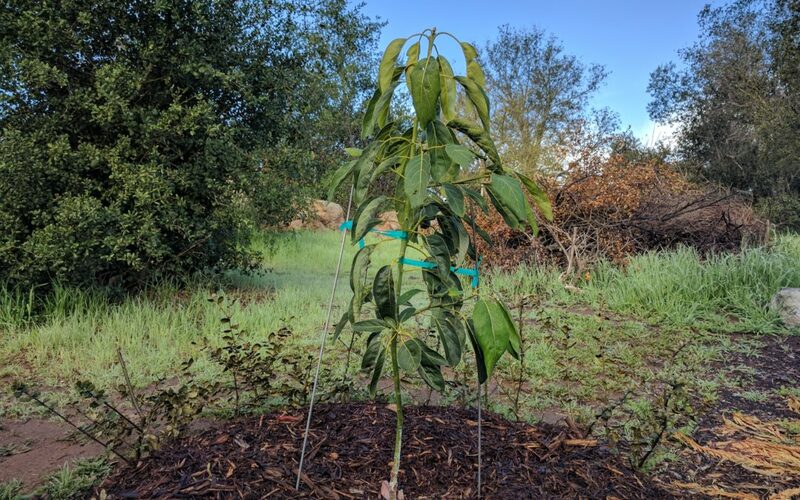 An avocado afterthought: Because you need all the pollination help you can get, you might want to add a second avocado tree that is well-known to be highly fruitful. Hass is very fruitful, but some others are even more so. A couple varieties that come to mind are Lamb Hass and Reed. I know of a guy who grows a highly productive Reed avocado tree in a greenhouse in central Texas. Davis is a great place. My favorite gardening radio show is the Davis Garden Show. Maybe your daughter has listened to it? I love the whole package of having my kids growing up eating from the garden and caring for our chickens. It’s affirming to hear that your children have turned out well with a similar upbringing. If there’s a sprout coming from the trunk, then there must be some life in it. It has taken 6 yrs for our Haas avocado tree to bear fruit. We had 86 on the tree when the landscaper came to cut the lawn and helped himself to 69 of our 86 fruits. How do you know he took 69 you ask? Because I was so happy to have the avocados I planted, I would sit on my lounge every morning, drinking my coffee and counting the fruit. Anybody with an avocado tree can relate. I hope more fruit will come. The fruit wasn’t even ready. Will more come this season. This is the 1st yr bearing fruit. We have him on video. Ouch! Carlos, it hurt to read that. And yes, I can relate so well to counting your avocados. Sounds like your tree is very ready to produce big crops though. So if it’s flowering this spring, I’d expect another 86 or so for eating next year. Hi, Greg! Was wondering if you’ve ever purchased an avocado in a 24″ box? They’re expensive, but I’m impatient! Will the larger size make it harder for the plant to acclimate? The biggest avocado trees I’ve ever bought and planted were in 15-gallon containers. Yes, they are wildly expensive, but you do get a big tree that is capable of bearing a crop its first year in the ground. Those trees sometimes have fruit on them while still in the box. 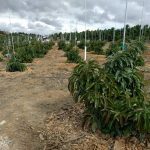 The main downside is that the tree is likely to need staking and restaking for at least a couple years, especially if it sets a lot of fruit and that fruit imbalances it. This happened to a 24″-box Hass that my aunt had planted some years back. Some fruit and limbs got sunburned. But I’m certain that if you buy such a tree that is healthy (uniformly green leaves, balanced canopy) and hasn’t been in the box for too long (not too many roots circling and poking out the bottom of the box), then you can acclimate the tree to your yard over time, and eventually it can be a freestanding beauty. Hi Greg! I planted a holiday variety for a small backyard space six years this spring. She is spindly and not very bushy. I got just two tiny fruits last season. She sets out flowers and has the creamy roots you describe. A huge bottle brush supplies tons of bees and I have native wasps too. I don’t fertilize but keep a thick leaf cover. I think she’s not getting enough sun. 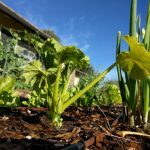 I’m in Long Beach, Adobe soil. Other than the sun, she should be happy. Do you think it’s just sunlight keeping me from getting a better crop? Probably gets 10 total and six direct hours of sun per day, morning sun being blocked by the bottle brush tree. Any suggestions? Just found you, love your sight! Thank you. Spindly growth does indicate low light. You’re probably right about that, and maybe you can trim back the bottlebrush? In terms of productivity though, I know of Holiday trees in other yards that are around your tree’s age that still only get a couple fruits each year. In my experience and observations, Holiday avocado trees are not as productive as some other varieties especially when they’re the only avocado tree in a yard or neighborhood. It sounds like you may not have space for an additional tree, but if you do (and you can keep it pruned small) you might consider a B type that fruits in winter or spring, such as Fuerte, Bacon, or Sharwil. 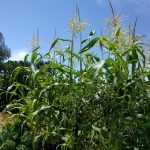 Plant it right next to your Holiday for cross-pollination benefits. Thanks Greg, I am going to try to make some room. And bring some light! Thank you for your reply. I have a 40 year old Feurte avocado tree. It produces millions of flowers . Year ago it produced a lot of fruit. Now the fruit often sets on and then suddenly drops. It is healthy looking. We fertilize it twice a year and water it regularly. It is planted in soil that is really well drained on a slight slope. I am in El Cajon, CA. Perhaps we are watering incorrectly. I would like some ideas. This year we had hundreds of 3 Lon fruits one day in a few days they were all on the ground. We recently wind up with about 50-60 fruits bur none this year. There is another tree at a neighbors house about 240 feet away. They don’t take care of it at all and it is very fruitful. Thanks for any ideas and help. Tough to make any hard guesses without seeing the tree and knowing a little more about its past, but I’ll give you some things to consider. One is that avocado trees sometimes have a lot of fruit one year and then little fruit the next year — sometimes even zero fruit. This is natural and inevitable. Another idea is that many avocado trees, especially in inland areas like El Cajon, lost their young fruit this summer during the extreme heat of early July. Many of my trees lost most or even all of their young fruit. Lastly, I hate trees like your neighbor’s! It’s just not fair when some people try so hard to care for their trees yet have problems while others neglect their trees and get tons of fruit. That being said, is it a Fuerte? If it’s another, less tasty variety, then we don’t have to be so jealous.